Nonza is a village situated on the western coast of Cap Corse, about 15 km north of Saint-Florent. The village is best known for its impressive location, with some of the ancient houses in the village perched atop sheer cliffs that plunge up to 100 metres to the sea below. The brightly pink painted 16th century Church of Saint Julie is the starting point for your stroll through the quiet surrounding village streets lined with traditional houses, along with the small chapel next door. 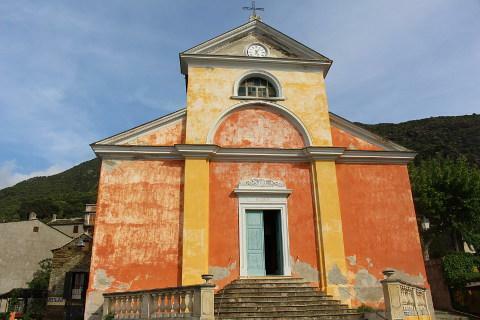 The classical style church, painted bright pink-orange, stands on the site of an earlier church built in the 14th century. Be sure to go in to the surprisingly light interior of the church to see the substantial decoration on the walls and several 17th-18th century paintings. Walk up through the village to the Paoline Tower, built in the 18th century on the site of an ancient castle, and also dramatically situated above the water. You can visit the inside of the tower which is now a gift shop selling jewellry and scarves etc. 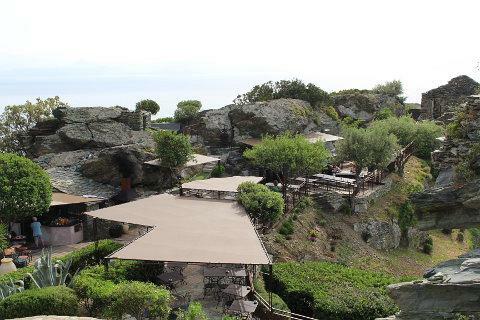 As well as views over the sea and village you have views over the ruins of the ancient castle which has now been converted into a fantastic bar - what a setting! 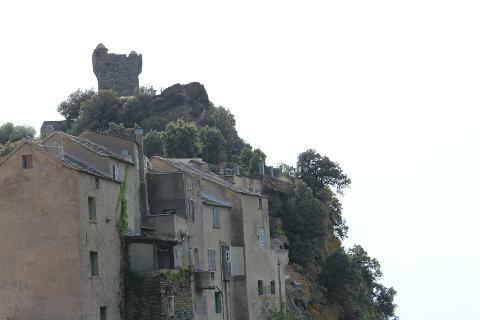 Not only set in the ruins of a castle but with views out on both sides of the promontory over the sea. Apparently the castle was the site of a dramatic battle between French troops and the Corsicans. The Corsican garrison deserted during the battle but their captain, a criple called Jacques Casella, continued on his own by fixing wires to lines of muskets so that he could fire them on his own. By firing and shouting as if to his troops he eventually wore down the French who called for a truce. What a suprise when a solitary old man on crutches walked out! As well as the ruined castle above the village, you will also see the ruins of the home of a local noble family in the 16th century called the Sassa and in what must have been an idyllic clifftop location. On the edge of the village you can see the Fountain of Saint Julie*. To reach the fountain, and asociated chapel, follow the short path that descends a flight of steps near the northern entrance to Nonza. * Saint Julie is the patron saint of Corsica, martyred here at Nonza in the early 4th century. After being crucified her breasts were cut off and thrown at the rock, which immediately and miraculously gave rise to the natural water springs at the site. A few hundred metres south of Nonza and close to sea level you can also see the ruins of the 13th century Convent of Saint Francis. There is a beach below Nonza, a 10 minute stroll down a rather steep path - a 'new' addition to the village, being formed from waste rock cast into the sea by the asbestos factory that operated just further up the coast in the 1950's. The beach looks very unusual as it is grey. Apparently it is safe for sunbathing but we were told that swimming from the beach is dangerous . 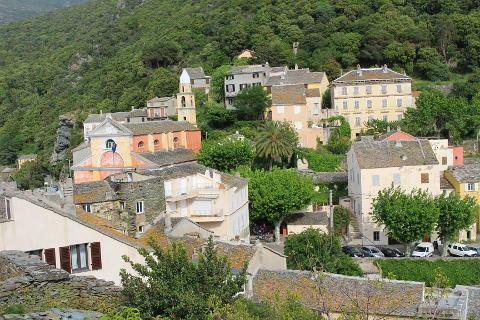 One of our favourite places on Cap Corse is the lovely village and harbour of Centuri. Further north is Ersa at the very tip of Cap Corse as well as the villages of northern Cap Corse. Over on the other side of the peninsula is the port and city of Bastia.